I'm starting a DIY wall shelf project. I'm not very handy, and I've never done anything like this before, so I'd love some advice/guidance! The end goal is for the shelf to hold a 3 gallon aquarium (18 x 5.5 x 7"). The total weight of water is around 25 lbs, but I want the shelf to hold at the very least 50 lbs to be safe and to include the tank and rocks/material itself. Planning for the shelf itself to be 10 inches deep. There are a total of four, though the fourth stud (one closest to the door) seems to be narrower than the rest. I'm thinking about using the first and third for the brackets, which are about 24 inches apart. Do the locations of the studs seem right? What I'd like to know is what type of screws to use? What length? Diameter? Does the type of wood for the shelf itself matter a great deal? Would the brackets being 24 inches apart cause the wood to bow under 50 lbs? Is there anything I'm missing? Important things to take into consideration? Another thought you may not have considered - theres a door there that opens toward the shelf. Please fit a permanent floor-mounted doorstop so it can never ever swing open and hit the shelf. The impact could drop your aquarium and thats no fun for the fish or for whoever has to clean up all the water afterward. Those brackets are barely adequate for your purpose. They may flex and even collapse under that load. At best you'll probably have a sloping shelf. You need heavy brackets with diagonal bracing, along the lines of closet shelf brackets. I usually use what are commonly known as max brackets, however. They're made with eighth-inch steel and are designed to carry the type of weight we're talking about. There are two remaining critical components to your setup. First is that the brackets need to be fastened to the wall with lag screws or large panhead screws. Use the largest ones that fit the holes pre punched in the brackets. That's usually 1/4" or 5/16" for max brackets, or #12 for closet brackets.. They should penetrate the framing at least 1". The second is the structure of the shelf itself. An aquarium needs uniform support of the glass to prevent cracking. I would install the max brackets and then lay flat two by fours or two by sixes horizontally across them to create a rigid base. In my experience if you support the longer sides of the aquarium you can have small gaps between the front and back base support boards. In other words, two pieces of lumber running lengthwise at the front and rear are enough. My take is in the middle between isherwood's and Machavity's. The brackets you reference may be rated for the load, but my experience with them is that they can flex and sag under a load, so the shelf might tilt. A braced bracket, like isherwood suggests is appropriate for this. You could even use something a little more decorative as long as it's rated for your load. With adequate shelf material, two of this type of bracket will be fine. You could use three if you want. You will be supporting everything with at least 6 screws going into studs. Good quality #10 or larger screws that go 1 1/2" into the stud should be more than adequate for this load. They need to go through the bracket and drywall before they reach the stud, so 2 1/2" screws would be a common size and adequate. For the shelf, 1x boards are only 3/4" thick and are likely to sag under a heavy load, especially with only two brackets. 2x are overkill and may look strange as a shelf. What I've often done for heavy-duty requirements is use a stair tread. They're 5/4" wood, intended to handle a lot of weight. They're good for deepish shelves. Nominal 12" width (actually closer to 11 1/2") is a standard size. If you really want it shallower than that, it can be trimmed. The link is to a standard 3' length, but they are available in longer lengths and you can cut them to size (or the store will do it for you). They also have a bullnose edge, which makes them attractive as a shelf. Consider a box instead of a shelf. This is quite natural for an aquarium/vivarium: Various maintenance (food, cleaning, testing) materials have a natural place there. Possibly a few books on fishes. Or some of your machinery can be neatly worked into this (timers, specifically). The simple idea is that the "vertical" bits are rectangles and resist deformation, so the worry that it all tilts forwards is taken away. See under "torsion box" and possibly "floating shelves" on various Make It / Instructions websites (you know which ones...). This saves you from choosing brackets for their style/colour/strength; if you fix the whole with brackets, they're hidden inside so go for cheap and strong (two thick stubby plates with many holes in an L-shape; some on wall + top shelf, some on wall + left/right verticals so the whole doesn't want to sag forward). So: get two long, flat horizontals and make some verticals, probably three or four. Soft- and hardwood multiply CAN have beautiful parallel layers and hence neat edges, or they can be horrible from cheapo big box stores (one batch to next differs, so come back after month). 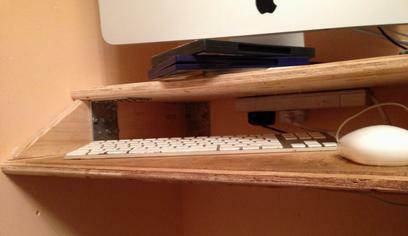 The plugs are in the back as you can see, the keyboard shelf stops 2inch from the wall. The bracket into the left edge is pointless AND ugly (screw through the side into wall stabilizes it, not that bracket); but in your case two of those brackets could go from wall to the bottom shelf. So whether with brackets (out of view) as above, or only wood-and-screws depends on what you want to invest and how to look: If purely from wood, it saves you brackets as you'll still have wood left over after this anyway. I have an inordinate fondness for pocket screws (first back-with-verticals into the wall, then top from underneath, then bottom from underneath; or the other way around if it's above not below eye-level. Actually, it will sag less than predicted there. The Sagulator works as if the shelf is covered with loose sheets of paper (one-page-books). However your aquarium is one solid unit; if the middle were to bend out-of-the-way, the load would move to the left and right ends. The above holds for a solid item (like a steel I-beam), light-enough-to-be-stable (a glass vivarium with little weight in contents), or a slightly bendy one (a wooden vivarium, my usual thing) stored on your shelf. What an aquarium does when its support is bent slightly out of shape I don't know, but breaking glass or leaking seams seem reasonable expectations. Make a test from scrap wood (from a pallet, or from someone else's demolition, ... ), to see your own precision, check stiffness, confidence. Test any of the following steps you're unsure off (like glueing so the excess isn't squeezed onto the decorative outside; pocket holes; clamping; ... ). Calculate the dimensions: Keep track of the fact that with a back, the top- and bottom are different depth from the sides/verticals (namely, material's thickness + a hair). So for rounding off, say outside dimensions are 40cm deep by 100cm long and 12cm height with 20mm thick sheet material (it's not! it's nominally 18mm but can easily vary a mm either way even among the same batch! so check when choosing your sheet, as well as look for decorative/defects/... ). Then top & bottom are 40x100cm, back is 8x100cm, and the "legs" of the "E" are all 8x38cm. note in this arrangement, looking from the sides you see all edges: top, bottom, and back; you could veneer over this, or add a second piece of 12x40. Plug your battery-powered drill in so it'll be charged, possibly borrow a second one (one drilling, one screwing: no bit-switching). Go to a Big Box store that has a panel saw (typically "5free cuts" or so). Choose your sheet (by decorative grain, no visible defects in the bits you want, ...) and check the effective thickness (take a caliper from the hand tools department). The thing is often more precise than accurate: You ask 40mm, they'll cut 39mm; but it remains 39 until they re-set the machine. So make sure all thicknesses (8cm in my example) are cut in one go, the whole "E" (plus short spares? ); then let them cut the top & bottom for depth in one go (40cm here); then cut top, bottom and back to width (100cm) in one go. Now measure the 40cm minus effective sheet thickness to cut the "legs" to size (38cm here), and see if it correctly fits (hand-assemble); if you have spares it's easy to redo with a mm more or less. Buy a simple (Kreg Junior?) pocket screw jig here or online, or borrow. Borrow whatever clamps (over "12cm" jaw width) you can get your hands off; too many doesn't exist. 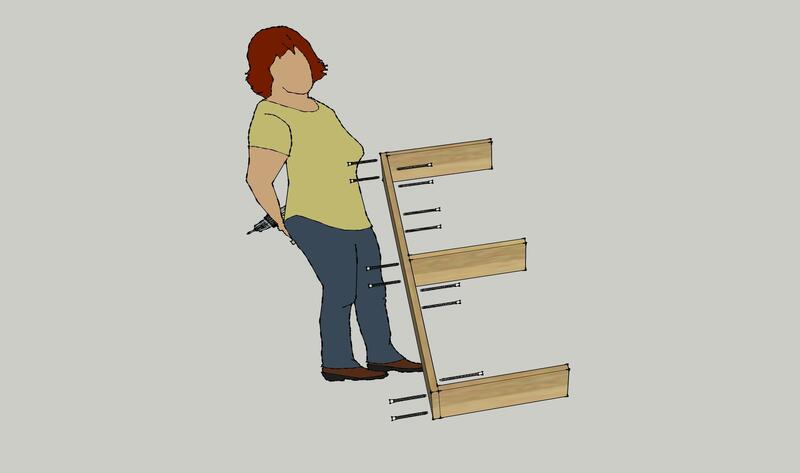 Treat your stock as your want: some sanding, a first layer or two of transparent varnish on the hard-to-paint insides, bevelling, ... .
Assemble the "E" of illustration: You will want to clamp or hold it nicely square (you have lots of known-rectangular stock now!). So pre-drill both the back and the "legs" ("pilot holes"), maybe test-screw one to see how precise (then unscrew). Now put a bead of wood glue (closer to the inside of the shelf than the outside, if excess squeezes out) and screw together (wiping away excess). This will markedly improve stiffness. Screw the "E" to your studs. Glue here will do some but not much good, but turns eventual removal into a mess (removing may tear the plasterboard to bits). Pocket-screw the top onto the "E". Probably first test-fit to see your "legs" aren't too far off straight angles etc. Then bead with wood glue (closer to inside than outside, for wiping off excess) and clamp all into place. Remember you should have loads of neatly-squared spares of exactly your "8cm" height to use for this. Let it dry and then drill pocket holes and screw them in. Now for the bottom you will probably just drill in 3 screws per "leg", vertically (no space for pocket drill): Same operation with glue for stiffness. Use a "countersink bit" so the heads of the screws sink below surface (then possibly finish with a hole-cover, dot of glue, ... ); or just drill very shallowly with a screwhead-sized bit, to have same effect. If the bottom is "decorative", consider doing this top/bottom switched: The aquarium will cover those last non-pocket-screws, and/or you have a cover between aquarium and top shelf. Similarly, if you've made a complex arrangement for the electrics, it may be easier to put in bottom first, then electrics, then top; but take into account replacements may have other sizes and/or must be installed in finished shelf not re-opened. Otherwise, don't glue the bottom so you can re-do this arrangement later. If you wanted anything fancy (simple sliding door to hide messy supplies), now it's too late, whoops: The middle "leg(s)" should have been shorter; a simple track can still be made from stripwood. Similarly, you should have cut a notch out of the bottom shelf near the wall, if you're hiding electrics for pump/timers. Note that if you have a good reason for it, making the "back" extend below and/or above the rest will make it all more secure/stiff for better fixing to wall. So a tall back as aquarium background may be neat. 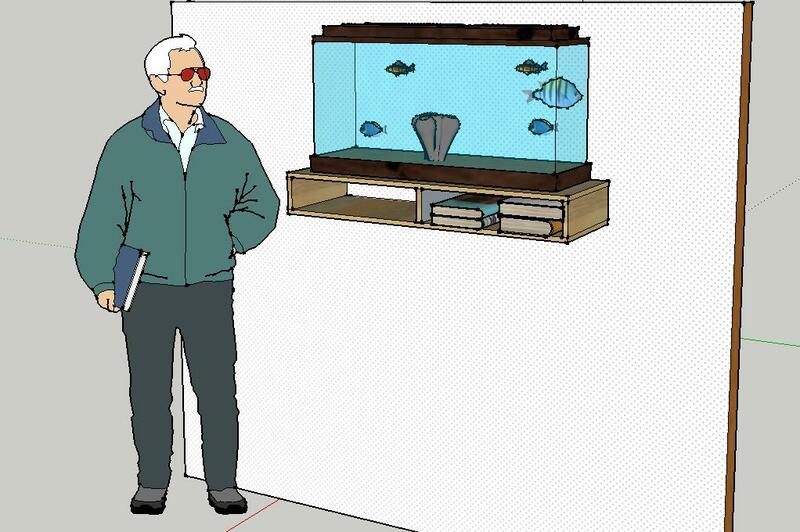 Or a row of coat hangers for children below the aquarium would also work (making use of otherwise dead space); though if space is your worry you have to question why didn't you make a freestanding cabinet as suggested elsewhere. For more fancy stuff (say, a neat slide-out drawer for the supplies, no electrics) I measure up things for sale nearby (whether recycling/charity furniture store, Big Box configurable wardrobe, or IKEA Pax) and build to those dimensions. E.g., IKEA had external drawers for Pax, 50/75/100cm and 8/16cm tall, in several finishes (now only internal ones I think); so it's trivial to build the above "box" to the surrounding dimensions, neatly drill the fixing holes needed (before assembly) and insert the rails, then slide in drawer. Or the hinged door, or plastic storage box, or whatever else you're repurposing. There are several different forces involved here, and you have to think about all of them. First is the vertical force, i.e., just the weight of the shelf and its contents, pushing down. Picture holding a weight over your head. Screws and nails are quite strong against that kind of force; they won’t fail unless the force is strong enough to break them in two. Second and third are a couple of forces that arise because the weight of the tank isn’t directly over the attachment points. They’re the big ones you have to deal with. Imagine holding a weight in one hand with your arm stretched out horizontally. That’s a force that the brackets have to handle, and it’s much stronger than the vertical force. Those brackets are rated by the vertical force they can support. They just aren’t strong enough to handle that twisting force. If the force is too large the brackets bend. At best your shelf is no longer horizontal. At worst its contents end up on the floor. The third also comes from that twisting: the bracket will be pulling away from the wall at the top, and that means that whatever is attaching it to the wall has to resist that outward pull, which means big screws or lots of little ones. If the force is too large the top pulls away from the wall, again dumping the contents on the floor. Paint the board a nice color. Since it will hold an aquarium, I would suggest a semi-gloss paint. It will resist any water spills better. 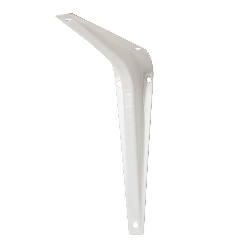 Again, if you're not after fancy, use a standard shelf bracket (the ones you linked are rated for 100lbs). Because you've identified the studs, this will make your shelf sturdy. I would use only 3 brackets (skip the second from the right). #8 1.5" screws into the wall should suffice, with #8 3/4" screws to hold the shelf onto the bracket. When you're at the store, look for actual shelving, not just wood. There are plenty of pre-cut shelves that can handle what you want, and they look great. Your studs SHOULD be 16" on center (from the center of each stud). 24" is usually for sheds or the like, that don't have much weight (no drywall, shelves etc). Older homes may have 24" OC, This looks like a wall that just goes to a closet, it may be spaced at 24", since it's not load bearing, and it doesn't hold siding. As for the weird spacing on the last 2, do you have power on the other side? If you do, be very careful! There will usually be boards on all four sides to support the box, sometimes there will be an extra complete stud floor-to-ceiling. A lot of great ideas and points made above, but I'd like to address this last point with a question that I didn't see asked or mentioned in any responses posted yet. Do you live in a region that has earthquakes? If you are putting a 25lb+ object on a shelf you might want to consider what might happen if the whole house starts to shake. Perhaps some form of strap or fastener might be prudent. There is also the option of additionally suspending the shelf from the ceiling. The ceiling might be able to absorb higher forces than the wall. Keep in mind that you might need to re-tension even steel wires from time to time. Not the answer you're looking for? Browse other questions tagged walls studs or ask your own question. 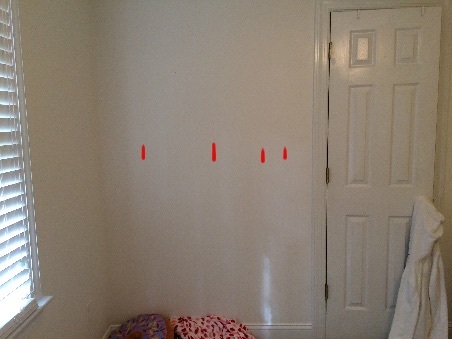 How much weight can the studs in a non load bearing wall support? What size expansion gap should I leave between my wall a hardwood floating floor? How should I build a low profile stud wall in a basement? How to avoid nailheads in stud behind plaster? Where are the wall studs? how much weight will a 1.5" long wood screw support when screwed into stud?